If you haven’t seen Jerry Maguire by now, don’t bother. It’s not that it’s a bad movie, per se, it’s just something that hasn’t aged incredibly well. It’s really 90s, overly Cameron Crowe-ish, and features Tom Cruise exhibiting a level of obnoxiousness I didn’t think even he could reach. So I guess if you’re into all that, go ahead and check this one out. I don’t really get all the hype around Cameron Crowe’s films. Almost Famous and Fast Times at Ridgemont High were both good, but I wouldn’t go out of my way to watch either again. Then there’s Say Anything…, a rom-com whose male lead is kind of a stalker, but everyone just sort of glosses over this fact because young love, I guess? Anyway, I think the problem with his brand of storytelling is that it is incredibly earnest and optimistic, and I have been too hardened by this cold, cynical world. I find much of his work cloying, with Jerry Maguire being no exception. As it stands, I found it hard to connect with any of these characters. Jerry (Cruise) starts off as a jerk and seems to take forever to become a decent human being. Dorothy (Renee Zellweger) comes across as too naive for someone in her situation (a woman in her mid-twenties with a kid and a career). Dorothy’s son, Ray (Jonathan Lipnicki), is your stock overly precocious child character. Rod (Cuba Gooding Jr.), Jerry’s only client, seems to do a lot of yelling and little else. I really didn’t care what happened to any of them beyond rooting for Dorothy to leave Jerry behind. Of course this doesn’t happen, because this is a rom-com so these two must end up together in the end. You never can tell which movies are going to become wildly popular with its audience. I think Jerry Maguire came along at the perfect time, and struck a chord with viewers in a way that was completely unexpected. It spawned multiple quotes that have been repeated and parodied ever since. But in 2014 I just don’t get it. Full disclosure here, I had never seen Jerry Maguire the whole way through. Most of what I knew about this film involved catch phrases like ‘show me the money’ and ‘you had me at ‘hello’’. I was also aware that the film contained a rambunctious little toddler who carried on about how much a human head weighs. As you can see, for such a well-known film, my knowledge about it was minimal. Tom Cruise plays Jerry Maguire, a disillusioned sports agent for a successful firm that thinks he can work for his clients better if he has less of them and provides them with more support. This goes against everything his employers stand for so he walks out on the job, asking anyone else as bitter as him to come along. The only taker is single mother Dorothy (Renee Zelwegger). She becomes Jerry’s assistant as he furiously fights his old employers to win back his former clients. He is only able to convince one to stay with him, football player Rod Tidwell (Cuba Gooding Jr). Now that he has one client, Jerry must ‘show him the money’. Complicating matters is the fact that his old firm is out to get him and there is also a budding romance between him and Dorothy. Jerry must decide what he wants in life to be happy and if that involves sports stars or single mothers, or both. Jerry Maguire is a fine movie, but I did not really understand the hype. People spoke about it when it was released like it was a Best Picture contender, and while it was good, it really doesn’t feel like much more than a generic romantic comedy. Tom Cruise is good as the sports agent with a conscience and Renee Zelwegger became a star after she told Jerry he had her at hello. The annoying kid was not as annoying as I expected, in fact I can kind of understand why he got so much press after the film was released. Jonathon Lipnicki is adorable as Dorothy’s son Ray. He ends up being the reason Jerry hangs around for so long, and it’s completely believable because the two clearly have an affection for each other. 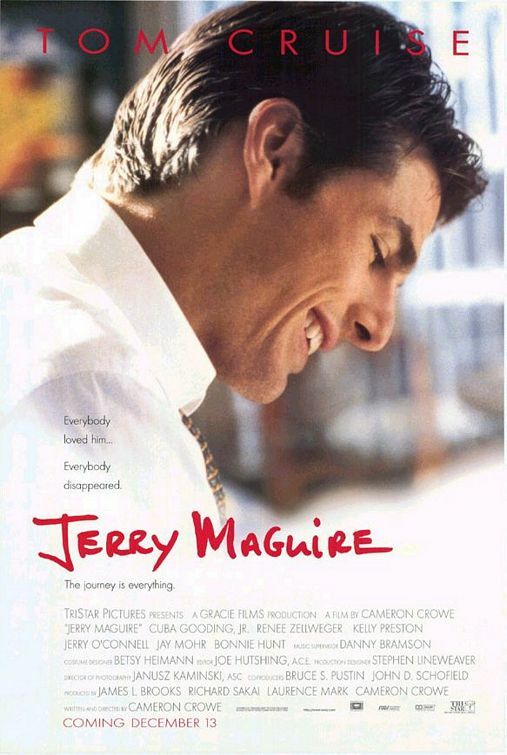 Jerry Maguire suffers from having a lot of hype surrounding what is not much more than a generic romance film. The filmmakers try to cover this up with a lot of bells and whistles of professional sports, but at the end of the day, this is just a normal romantic comedy, not much more, and not much less.